‘Andy Miller has created an eclectic mix of prose and poetry that uses writing over a forty year period to illustrate some of the most important influences on his journey through life. Each piece is different but helps to represent a coherent set of attitudes and feelings. He is adept at bringing landscapes to life and the impact of those landscapes on people struggling to traverse them. He is even more adept, with a very light word-sketch touch, at introducing us to the character of those whom he meets. The book is both unique and excellent’. I met Alastair, an experienced writer and sailor from N. Ireland, on my recent Tall Ships holiday. He was excellent company with the ability to tell a good story with wit and intelligence. Hence, and having heard quite a bit about its central arguments, I know I can recommend his forthcoming book, Four Thousand Lives Lost, as a fascinating, informative and well-argued read. He recognises that everybody knows about the Titanic and Lusitania but not so many have heard of the sinking of the Empress of Ireland in May 1914 on the St Lawrence in which more passengers died. Even fewer know about the first liner to be torpedoed, the Falaba, just six weeks before the sinking of the Lusitania. Alastair looks at the context in which these tragedies occurred, both the peacetime situation up to 1914 and the changed wartime risks that ships faced after August that year. I hadn’t realised that the inquiries into these four tragedies had all been carried out by the same man – Lord Mersey. 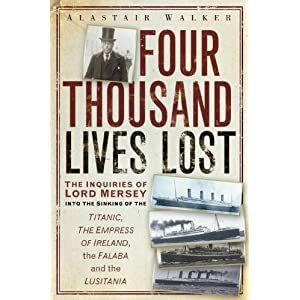 The book focuses on the captains whose decisions and actions at sea were at the centre of events but also asks questions of Lord Mersey himself. Was he over-concerned to protect the interests of the shipping companies? Did he stick too closely to the government line? Or was he his own man, making considered judgments in the face of complex and harrowing information?